Lantech TWAP-5002 series is a next generation EN50155 multi-function VPN router w/2x 802.3ac Wi-Fi + 2x Gigabit Ethernet(incl.1 PD)+ 2 serial ports** that support advanced VPN function, Load-balancing**(Premium pack), Protocol gateway**, EMMC Flash Storage**, Wi-Fi roaming** , Air teaming** for on-board / onboard-to-ground applications. The dual core CPU with 1.6GHz + 256M flash enables the router to multi-task smoothly. TWAP-5002 series supports optional TWCC** (Train Wireless Carriage Coupling) that enables auto wireless coupling to reconnect APs. With IEEE 802.11ac capability, TWAP-5002 can operate either 5GHz or 2.4GHz bands, offering the maximum speed of 2.6Gbps bandwidth (1.3Gbps per 802.11ac module). It is also compatible with 802.11b/g/n that can work with 2.4GHz for longer range transmission. The Wi-Fi 11ac supports AP/BRIDGE/AP Client modes can be diverse for most of wireless application. Client mode supports PMK** Caching and pre-authentication. Working with load-balancing** “Priority” mode, the AP client can enable router to transmit on Wi-Fi with first priority. 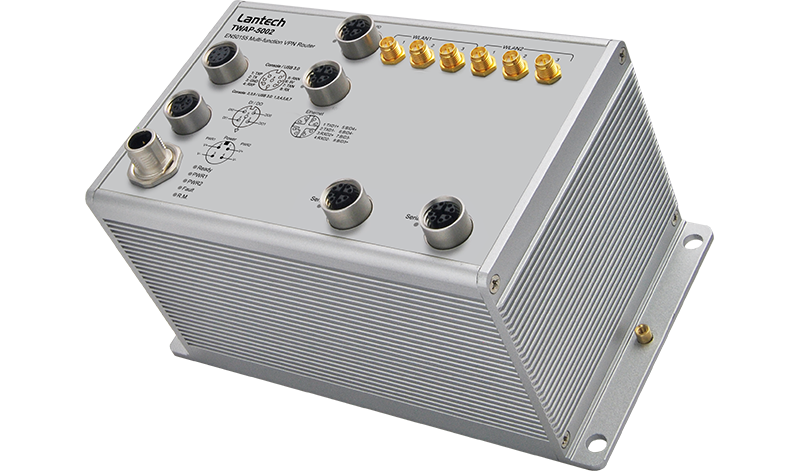 Lantech TWAP-5002 series adapts MIMO technology with Smart antenna transmission and reception for 3T3R. With six external detachable antenna connectors (SMA/QMA**) and optional antennas, TWAP-5002 can have better Wi-Fi coverage. TWAP-5002 support fast roaming** (optional) in coordination with Lantech Wireless Controller to allow encryption keys to be stored on all of the APs in a network. Client mode supports PMK** Caching and pre-authentication. The innovative Air-teaming** can combines multiple wireless links to achieve both high-sustainability and aggregated bandwidth. High sustainability can keep the network traffic alive even one link is down or severely interfered. Aggregated bandwidth can bind two link channels to provide the maximum throughput. The security support standards including 64/128bits WEP, WPA/WPA2 PSK (TKIP*, AES), 802.1x** ensures the best security and active defense against security treads. Lantech TWAP-5002 support up to 16 SSIDs, each SSID has its independent security and encryption. Standard Fixed Manually route by traffic type through fixed WAN link. Basic Package Failover Routes connections through preferred WAN link while others stand-by. Sequentially activate another link if preferred link fail occurs. Once failover will not failback until link loss. Weighted Round-Robin Evenly distribute the traffic over all working WAN links in circular order according to the specified weights. Custom Route Routing through the selected WAN for each specific traffic, ex: TCP/UDP port number and IP address. Full Package (incl. basic package) Sticky Session* Binding all connections in an application session to particular WAN link to ensure all connections in the session are routed to the same WAN link , that is suitable for security services like online payment etc. Smallest Load* Routes connections through the WAN link with highest free bandwidth ratio. The ratio = 1 – (traffic load / the capability of a WAN link). Fastest* Routes connections through the WAN link with lowest latency time. Optional 2 port serial connection for RS232 or RS422, 485 in which RS422/485 has 2.5KV isolation protection. The built-in Modbus gateway can convert Modbus RTU/ASCII to Modbus TCP for device control. The optional EMMC flash storage on router can offer 8G/16G/32G capacity. Besides traditional VPN peer to peer tunneling, TWAP-5002 support latest Multi-Site VPN function that is an efficient way for mesh tunneling. The registration is under cloud service and encrypted by SSH makes the connection easy and safe. It supports Multi-Site VPN, Open VPN, L2TP, IPsec L2 over GRE, NAT, and PPTP** for various VPN applications. The built-in Layer-4 firewall includes DoS**, IP address filter / Mac address filter* / TCP/UDP port number. 2 sets of DIDO function can support additional high/low physical contact for designate applications besides Port / Power events, for example, DIDO function can trigger alarm if the router was moved or stolen. In case of events, the TWAP-5002 will immediately send email** and trap. When the router is at remote area with limited access, Web control can help to get router status or remotely reboot by Web. The TWAP-5002 is able to work from dual 16.8V ~137.5V DC isolated input (WV model) that is particular good for vehicle, rail train, depot etc. applications. The built-in environmental monitoring can detect router overall temperature, voltage, current where can send the syslog, email**alert when abnormal. The graphic Wi-Fi signal strength and TX/RX rate display shows connection status at a glance. The built-in USB port can upload/download the configuration and upgrade firmware* through USB dongle for router replacement. It supports dual-image firmware* to choose which one to start. It supports dual-image firmware* to choose which one to start. The TWAP-5002 supports editable captive portal function that allows administrator to force end-users redirect to authentication page. The TWAP-5002 series is verified with EN50155, 61373, 45545 standard with IP65/54 housing. It passed tests under extensive Industrial EMI and environmental vibration and shocks standards. With CE & FCC radio certification for Wi-Fi and E-marking** certificate, the TWAP-5002 is best for outdoor community, vehicle, power substation, process control automation etc. For more usage flexibilities, TWAP-5002 supports operating temperature from -20°C to 70°C or-40°C to 70°C(-E) . Managed switch function is built-in and provides various L2+ functions for network aggregation deployment. It delivers ports and PoE management, VLAN, QoS, multicast, redundant ring, and security functions. High-sustainability: if one link member is down or severely interfered, the other link will keep the network traffic alive. Multiple channel bandwidths of 20MHz and 40MHz for 2.4G. Multiple channel bandwidths of 20MHz, 40MHz and 80MHz for 5G only. Client mode PMK** Caching and pre-authentication. Basic Package** Failover Routes connections through preferred WAN link while others stand-by. Sequentially activate another link if preferred link failure occurs. Priority Routes connections through preferred WAN link while others stand-by. Sequentially activate other links if overflow occurs. Custom Route Routing through the selected WAN for each specific traffic ex: TCP/UDP port number and IP address. Full Package incl. Basic package** Sticky Session* Binding all connections in an application session to particular WAN link to ensure all connections in the session are routed to the same WAN link , that is suitable for security services like online payment etc. All standard models are non-conformal coating, optional conformal coating are with –C model name; Optional bypass models are available with –BT model name; QMA connector models are with –Q model name; -40~70C operational models are with –E model name.